Upper UE RacerX arms. $75-200 Or UE EXT Upper arm. There are a couple on ebay but they are sold with the whole kits. Very expensive. Good luck on finding just the upper arms. I was able to find them. (Thanks Fred!) Old .15 maxx upper arms might work. Now you have to drill and tap your arms. The pivot ball hole at the end of your arms is 5mm it has to be drilled to 6mm and have the hole tapped. A local machine shop charged me $40. They offered to do it free but I didn't have all parts ready. I went back a few weeks later and a sales guy heard about it and made them charge me. You can do it your self too. The tools can be find relatively cheap. Just a tap set. You can sometimes find just the one tapper bit on ebay or amazon. 75-200 dollars. They are listed for 28 dollars a piece on at UE but they are out of stock. 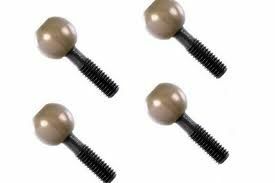 Mugen pivot balls $20-50 You will not be able to use all four of the Arrma pivot balls anyway. You need 2 Mugen Pivot balls without the stop and 2 with the stop. The ones without the stop on them go the bottom the ones with the stop go on top. The ones without the stop are getting harder and harder to find. If you can't find them you could dremel or file the stop off. 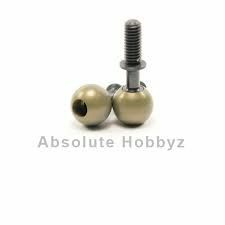 Arrma Kraton BLX axles $20-40 EBAY CLICK Make sure you get BLX. You could get the whole assembly You will need the 2 little parts inside the joint. The cvds that we will use don't come with the little parts. If you think you have the parts you can just buy the stub axles. Most cvds should do that are 124-126mm in length. The turnbuckles are up to you. $Free-30 The TRX3.3 112mm red tubes will work if you take off the supplied plate that comes with the Arrma Carriers. I suggest you find shorter turnbuckles and use the supplied plate. I think you will need around 95mm. Turnbuckles are easy to find. You could order shorter turnbuckles and find long rod ends that you could cut to fit. There are other things we could talk about. Like if bump steer isn't something you notice or care about you could get the Arrma Nero Carriers and keep your stock or aluminum stock arms. No need to get the expensive and rare RacerX or EXT. This will probably mean that different CVDs will be needed but you can use your Arrma pivot balls without having to get Mugen ones. Just remember when you tap your arms to tap them with a standard tap.